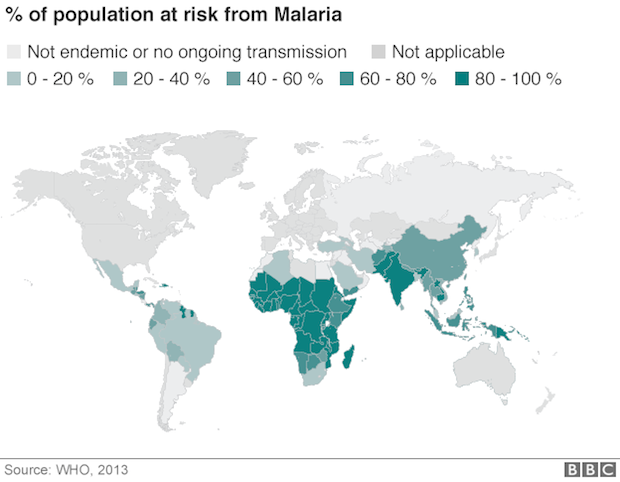 The world's first malaria vaccine has been given the green light by the European Medicines Agency. The Mosquirix jab, developed by GlaxoSmithKline, is the first vaccine against parasitic infection in humans, and could potentially save hundreds of thousands of people. GlaxoSmithKline has not yet said how much the vaccine will cost but has vowed not to make a profit off of it. Malaria kills roughly 584,000 people per year worldwide, most of whom are younger than five years old and live in sub-Saharan Africa. Malaria is contracted when parasites suspended in the saliva of infected mosquitoes enter the bloodstream. The parasites travel to the liver, where they mature and reproduce. While there previously had not been vaccines for malaria, there have been medications to treat it. However, some parasites have begun building a resistance to these medications.